The 4 wheeler automobile industry in India is witnessing some important changes. Cross-overs, Mini SUVs and SUVs are setting a new trend. This segment is validated by cars like Ford EcoSport, Renault Duster, Nissan Terrano and cars from other players. Maruti and Hyundai are the 2 big brands in India – In order to catch-up with market needs both these companies are launching cars in the Cross-over / mini-SUV segment. Hyundai‘s Creta and Maruti Suzuki‘s S-Cross are all set to be launched in few weeks time. Before the official launch, we try to compare Creta and S-Cross in this article by adding our perspective upon looking at their spec sheet and media reviews. 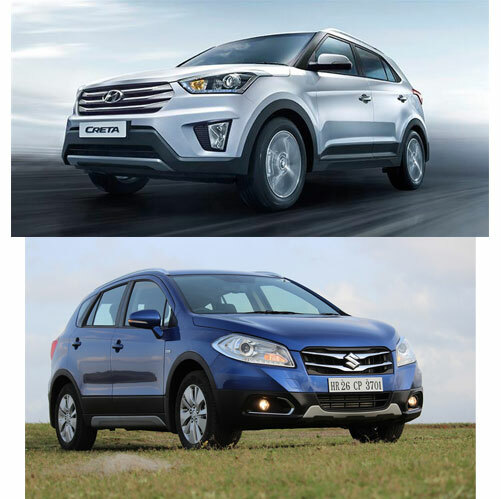 When it comes to looks, Creta and S-Cross look entirely different from each other. Here is the comparison of Hyundai Creta and Maruti S-Cross. Hyundai Creta and the Maruti S-Cross has their own charisma when it comes to design. While Creta appears like a proper Sports Utility Vehicle (SUV), the S-Cross has got a style of beefed-up hatchback. The fluidic sculpture 2.0 design language of Hyundai adds a very attractive look to Hyundai Creta. Some distinguishing features of Creta are the very sharp headlamps, protruded window line, a good-looking rear that makes Hyundai Creta an instant attraction. 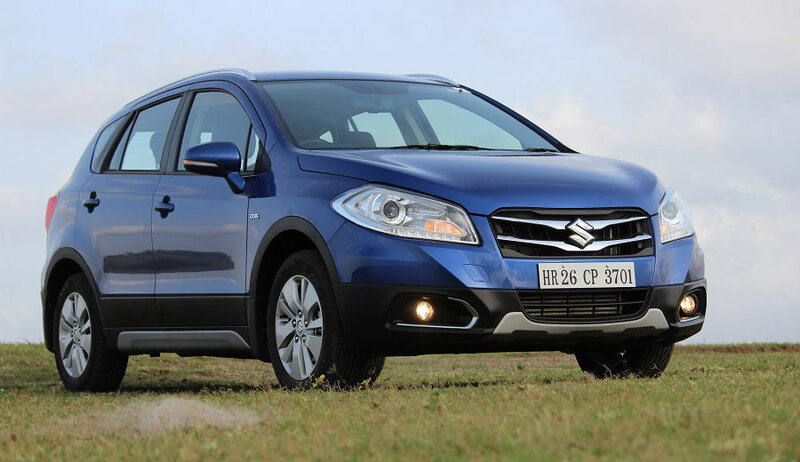 Maruti Suzuki’s S-Cross borrows the hatchback cross-over look straight on the face. Maruti S-Cross has a thick black plastic cladding all around the car. S-Cross doesn’t look like a proper SUV. When it comes to interiors, Hyundai Creta has a neatly laid out dash with inviting warm color patterns. There are vertical AC vents in centre console of Creta which looks particularly cool. One can say the interior space of Creta almost matches the interior space of Hyundai Elite i20. Hyundai has done a good job with interior design of the Creta. Maruti Suzuki S-Cross gets black interiors. There is nothing flashy about the dashboard in S-Cross, however it looks pretty good. Looks like the steering wheel of Maruti S-Cross is borrowed from Maruti Swift. The centrally mounted touchscreen infotainment system is the best-in-class. Overall Maruti has too done a better job when it comes to interiors. Both Hyundai Creta and Maruti S-Cross features almost are head-to-head matching each other’s features. The top-end variants of both Hyundai Creta and Maruti S-Cross is going to get touchscreen infotainment system, Bluetooth support for phones, navigation, steering mounted control, automatic climate control, LED daytime running lights, projector headlamps, and more. Hyundai Creta has a leading edge as it is equipped with 6 airbags which is not the same with Maruti S-Cross. Maruti S-Cross has a dual zone climate control while Hyundai Creta does not. Hyundai Creta provides you a choice of choosing between three different engines, namely: 121 bhp 1.6-litre petrol engine, 126 bhp 1.6 litre diesel engine and 89 bhp 1.4-litre diesel engine. All 3 engines of Creta is coupled to a 6-speed manual transmission gearbox. The 1.6-litre diesel engine of Creta is going to get a 6-speed automatic transmission which would be a first-in-class option. The Price of Hyundai Creta nor price of Maruti S-Cross has been revealed yet. Both the cars from different brands is expected to come with a starting price of INR 8 lakhs to 9 lakhs.